If you like seafood, shellfish in particular, then you’re probably a fan of Mussels. These commercial Mussels are Blue Mussels. But, no one I know is foraging for their own. A few do, mainly on the West Coast, but they are foraging Blue Mussels. Here in the Chesapeake, and along the Eastern seaboard we have Atlantic Ribbed Mussels. You can find some references to Atlantic Ribbed Mussels, but never for food. The articles all say they have no taste and are tough. I’m not sure what they are eating but they must not be eating the same ones I’m finding. I do not find Atlantic Ribbed Mussels tough, and I think they have a very nice mild, briny, Mussel flavor. This year instead of deer dog hunting on opening day of modern firearm season I decided to play hooky and ride down to the York River to an undisclosed location which is public access. I am not certain that shellfish foraging is a permitted activity though, so be careful where you forage. Virginia has a lot of privately leased river bottom, I do not believe you can forage on private bottom. Mussels are at the rivers edge hidden in the shore grass. You won’t find them much above the high tide line nor will you find them in even a foot of water. So, maybe the bottom lease stops at the tide line. It would take a serious codger to get mad for it though. Like I said, nobody even messes with them. Mussels like oysters are filter feeders. 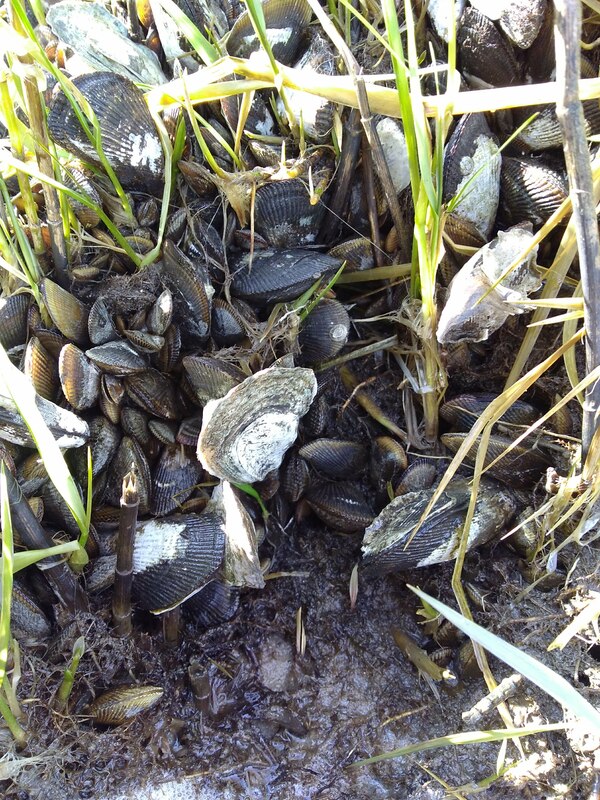 Where oysters are usually in the river itself, mussels live at the edge of the marsh. They act like the liver or kidneys of the marsh. They don’t filter toxins though, they are algal eaters, although I think they probably consume some zooplankton too. Sounds unappetizing, but that’s in fact what they do. Let’s be cognizant of their ecological role. Let’s practice reasonable take limits and take the largest mussels. I try to take 4″ mussels, but only estimate size in the marsh. I look over a cluster and try to pick out the largest of bills sticking up. When you find one, it takes some rocking and twisting motion to break it’s fibers. They have fibers that cement them to their surroundings. Be mindful not to crush up the surrounding smaller mussels. I ended up with about 5 dozen. This is enough for a recipe, but not enough for two. I try to get them processed without letting them sit around a few days. As I was foraging for mussels, I was also looking for oysters. I ended up picking up about 30 just at the waters edge or within a foot of water. Whatever I could reach from shore. The easiest way to eat them is to simply steam them. I enjoy them most in pasta. I have a Garlic Butter Mussel with Angel Hair recipe I just love. I use a big No10 cast iron skillet, stack them in, in one layer and add 3/4″ of water in the bottom. The 5 dozen barely fit, which is how I know it’s the perfect harvest limit. I steam them at 350 until the bills pop open. Not longer than 30 minutes but I don’t time them. I then pull them, and let them cool. Then use a butter knife to pluck the mussel meats and reserve for my recipe.